I am a huge fan of Urban Decay, it’s definitely one of my favourite high end brands along with MAC and Benefit. 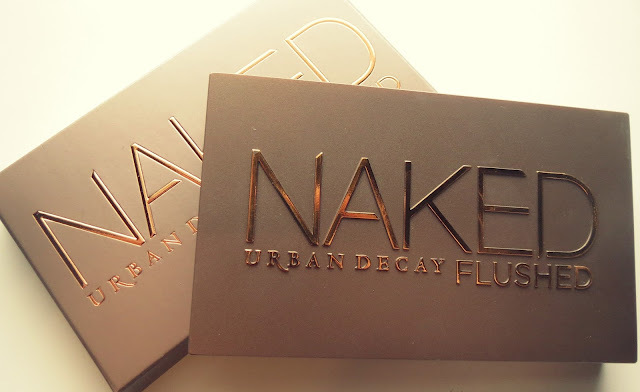 As soon as I saw they were releasing the Naked Flushed Palette, I spent numerous shopping days walking past the Urban Decay counter and stopping to stroke the packaging, standing with my bottom lip out. To say I was in love with this would have been an understatement. Then my friend Hayley bought it for me for my birthday in May, naughty goose as she spoilt me, and I have loved using it since. First off, the packaging is beautiful! I love the Naked line as it’s all bronze and sleek and the shiny gold writing just looks lovely. It seals shut with a magnet which is so handy as I don’t know how many nails I have chipped or broken trying to open the Urban Decay Naked Basics Palette, it’s a nightmare. It also has a large mirror the length of the palette which is always helpful when you need a make-up top-up. Once you open it, the powders are separated into three sections, the largest being a bronzer, the thinnest section a highlighter and finally the last section is a medium sized blusher. The bronzer is a lovely shade, definitely the perfect colour for fairer skin-toned lasses like myself. It has really fine shimmer that doesn’t look over the top at all. It’s so beautiful to use to contour the face and feels so soft to apply. They all blend really well. The highlighter is stunning. A cream/pinky gold colour with definite shimmer it really does stand out. It might not be to everyone’s taste if you do prefer a more subtle shimmer but looks so pretty under the brow bone and on the inner corners of the eyes. And finally the blush is a perfect shade for a fresh summer glow or for those “just walked in from the cold” flushed winter cheeks, a colour that can be worn all year round and and a teeny touch of shimmer, hardly noticeable at all though, definitely one of my favourite blush colours. The pigmentation of this product is insane as the swatches above is just one swipe across the product. The staying power is great and it will last a really long time. I’m so glad I got to add this to my collection, it looks beautiful on the vanity and even better when it’s applied. Priced at £20.00 I don’t think that’s too hefty considering you get a large amount of three different products in one. Have you used this product before? What did you think of it? This palette looks so pretty, the blush looks lovely! I really want to try this! It looks beautiful! © 2018 - Claudia Stenhouse. All Rights Reserved. Designed & Developed by Pix & Hue.